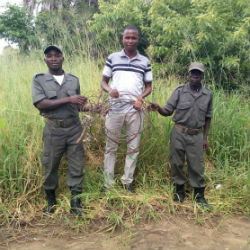 “Since childhood, I always dreamed of working in the wildlife and natural resources conservation sector,” says Isaac Banda, Executive Officer of Mnkhanya Community Resources Board (CRB) in the Luangwa Valley in Zambia. Isaac is also Co-ordinator of the National Association of CRBs in Zambia plus Co-ordinator of the High Five Club in Zambia, a UK charity that gives communities living with wildlife in Africa a hand up out of poverty. After finishing high school, Isaac started working for Mnkhanya Community Resources Board (MCRB) in his home area, a community-based organisation whose major responsibility is to protect wildlife and natural resources. The MCRB borders South Luangwa National Park, one of Africa’s most wildlife-rich protected areas between the Eastern and Northern Provinces of Zambia. 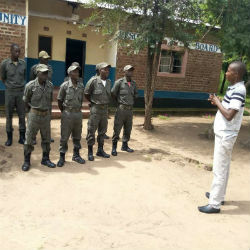 “Our work is based on three major areas; Community Sensitisation, Field Operations conducted by community scouts and Community Development Projects, and Implementation which is community benefits as a result of taking part in wildlife conservation and living in harmony with wildlife," Isaac explains. “My daily work is varied. I plan and deploy community wildlife scouts for both short and long day patrols for animal protection and rescue missions. 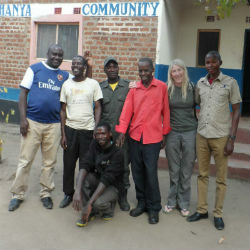 I conduct community sensitisation meetings on the importance of wildlife and natural resources conservation. And I co-ordinate the CRBs work in uplifting the local community out of poverty and implementing water, school, health and livelihood projects. Cheryl Mvula, Born Free’s Special Advisor to CEO, says: "Isaac is one of those rare species that puts wildlife and community before himself. He has faced many struggles over the years protecting wildlife and helping to lift the local community, of which he is part, out of poverty in Zambia's world famous Luangwa Valley. He and his family have endured extreme hardship in the name of conservation, at times going for over 18 months without salary. He is a true unsung hero of conservation, working in the background unseen and unheard. I am very moved that Born Free has seen the contribution of a humble, rural community person like Isaac and recognised him in this way. Both he and wildlife will be blessed."